Everyone will let your little one join in all the reindeer games because he looks too cute to deny! 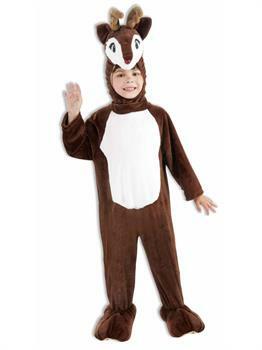 This Childs Plush Reindeer Mascot Costume includes a jumpsuit with attached shoe covers and character hood. The plush brown jumpsuit is long sleeved and features a stark white tummy. The matching, attached shoe covers transforms any pair of shoes into these reindeer's hooves. The attached hood features this reindeer's head. The brown and white face sits on top of your little one's head so that his vision isn't blocked by any mask at the Christmas party. He'll love feeling like he could lead Santa's sleigh this Christmas Eve! This Childs Plush Reindeer Mascot Costume will have your little one glowing with excitement and holiday cheer at the Christmas party this year!. Lets bring more fighting spirit to your team with mascot outfit. Let the crowd cheer for your team and you keep encouraging everyone with your funny mascot costume. Go for some extra fun this time and entice everyone with your laughable expressions in a Mascot costume. Are you really excited for getting a completely new look? Are you looking for a real fabulous party outfit to impress your friends? Your search for a perfect Halloween costume comes to an end with our Childs Plush Reindeer Mascot costume. Care Instruction: Hand Wash Cold Water W/mild Detergent. Line Dry. Do Not Bleach. Do Not Iron.